One of our hottest selling items specially in the summer is our 3oz Jello Injectors with foam holder. This ultimate party accessory is one of the most popular items in private parties, nightclubs, bars, beach parties, pool parties & more.. Hold 12 - 3oz Syringes and it has a square foam hold for comfort. Dont go a day without ordering our 3oz Jello injector with foam holder. See here..
Other than being a great party accessory, venues have learned for many years to use this product to generate extra income for there event or party. Nightclub Supplies has a specific section just for revenue generator like this 3oz jello injector with foam holder. 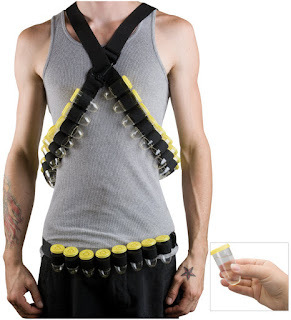 Also know as syringes, this party accessory will definitely be a huge hit at your next event..